Its specific name "capensis" is a misnomer, made by the botanist Nicolaas Meerburgh which believed the plant native of Cape of Good Hope (South Africa), but in fact it is typically a North American plant although it is establish in Europe with great success. In popular medicine the juice of the stalks of the Impatiens capensis is used against rash cause by Poison ivy (Toxicodendron radicans) although controlled studies have not shown efficacy for this purpose. 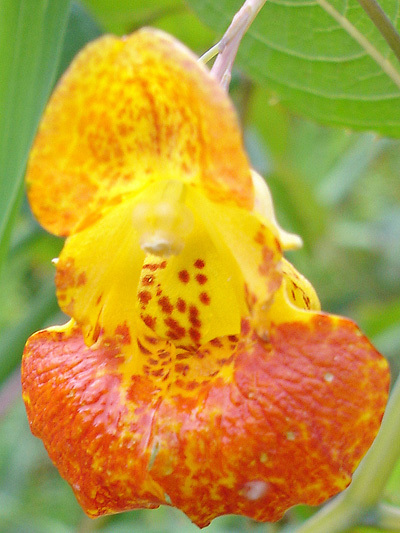 There is a variety of Spotted jewelweed with white flowers (var. Alba). Besides its hermaphrodite flowers, the plant possesses cleistogamous flowers (flowers which do not open and self pollinate) near the superiors leaves. Fruits possess the spectacular capacity to explode under a slight outside stimuli.